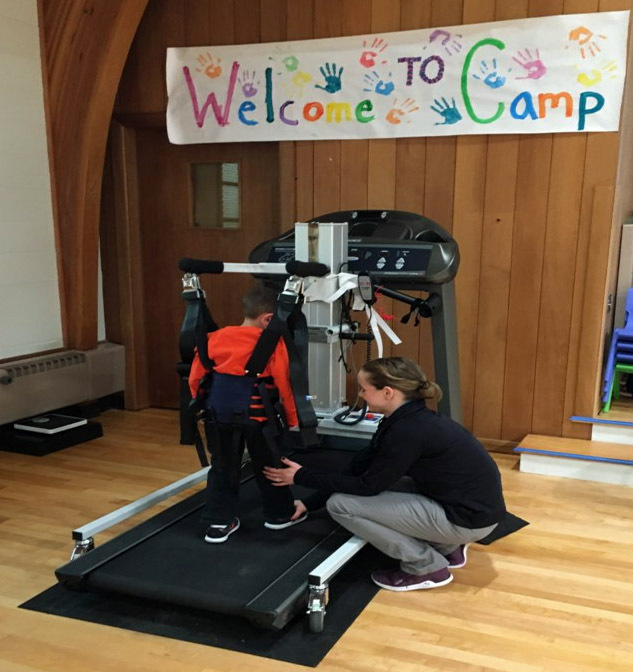 Physical therapists utilize the pediatric LiteGait® partial-weight-bearing gait therapy device with a treadmill for children to improve their walking pattern and gait. The LiteGait® system can safely suspend a child to reduce the amount of weight-bearing on the lower extremities so the therapist can facilitate a more typical walking pattern. As time and therapy progresses, the child can bear more and more weight through their legs and feet, while the therapist assists less and less. Through repetition and practice the child’s brain can “learn”a more functional walking pattern. Studies have shown that this form of therapy called, treadmill training, can help individuals establish a more functional gait. Studies also show that once a new pattern is established, it not only remains but can continue to improve with time. Intensive Therapeutics already serves so many children with hemiplegia to improve upper extremity functioning. The gait training program can be combined with services to address lower extremity functioning to improve walking, running and interaction with their peers. All interested families are interviewed and screened to determine eligibility for the program. If you would like to discuss the program more, please fill out the form below and one of our trained staff will contact you.